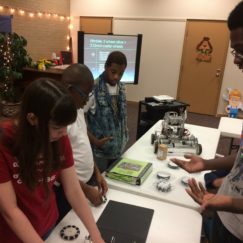 When we started up a robotics team as part of MWB’s Spark-O-Matic program last August, the thinking was it would be an amazing opportunity for our students to hone their STEM-based skills. 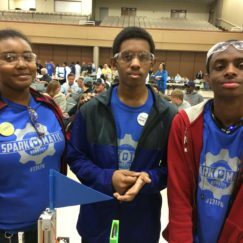 Enhancing STEM knowledge through designing, building and programing a robot is, after all, what programs like FIRST Robotics are all about. It’s okay to be more science nerdy, we reasoned, because we’ll still create great video documentaries, form production companies and do other arts-based projects in-between programing and building bots. 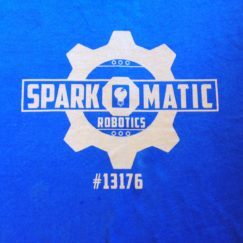 And, with robotics as a central component of Spark-O-Matic, the students will engage in something that could directly help with college (FIRST offers lots of scholarship opportunities) and get them on an even more direct path to highly in-demand STEM careers. 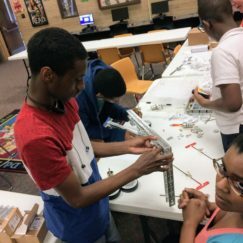 As we started our robotics program, we quickly learned that we might not have to sacrifice the arts for the sciences. 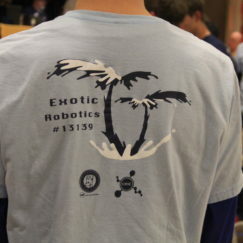 In fact, there appeared to be several warm, fuzzy, digital arts-oriented facets to launching a robotics team. 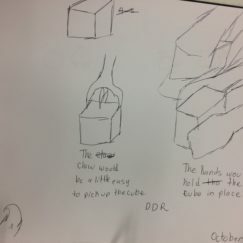 For instance, each FIRST Tech Challenge team has what’s called an Engineering Notebook, which can be a notebook or a website. 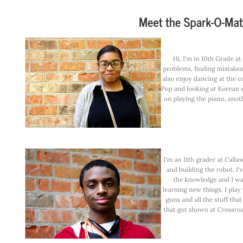 In Spark-O-Matic, we do websites. 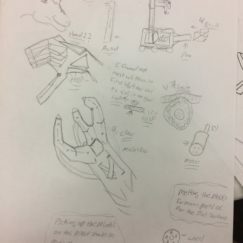 So, we just did our own spin on an engineering notebook¬†that let the kids creatively tell their story.¬†Also, each FIRST team has to have an attention-getting team T-shirt. So, hey, we crafted our own artful T-shirt design from a sketch by Spark-O-Matic’s Kelvin Walton (Kelvin’s pictured top right, below). 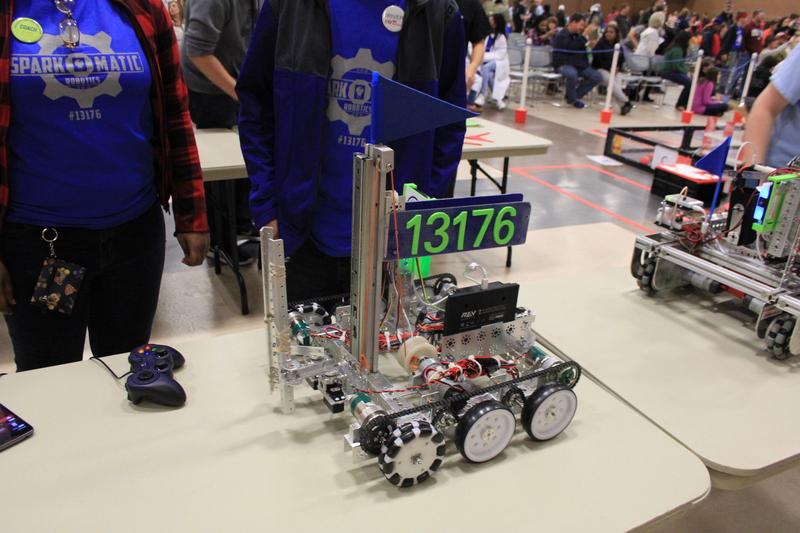 Robotics-based STEM got even more STEAM-Y as we competed in our first FIRST Tech Challenge this past Saturday. 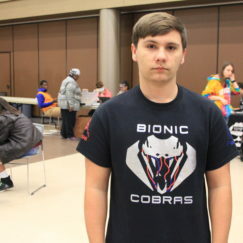 Come to find out, we weren’t the only team whose members can design their own T-shirts. Creative team websites abounded as well. 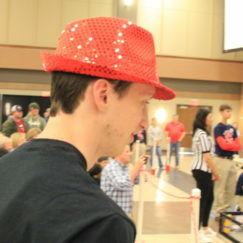 So did crazy hats. In short, these machines do indeed turn STEM into STEAM. It’s all woven right in there together. 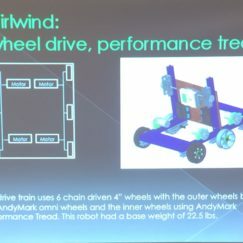 Bottom line, I’m not so panicked now about leaving the arts behind as we move forward with robotics. The same Mac laptop we use for crafting videos is now what we use for writing robot code. 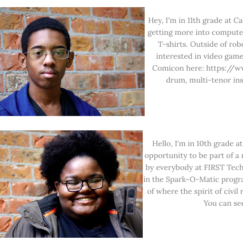 Spark-O-Matic has a new, multi-faceted, geeky, artsy digital heart. 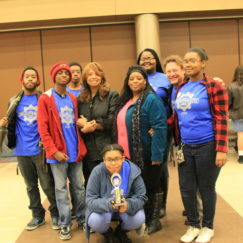 Besides, our Spark-O-Matic team had a fantastic time at the competition. 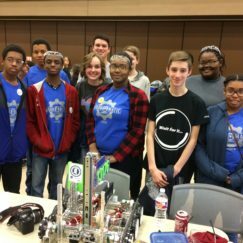 We made it to the Final 4 (forming an alliance with another young team), we learned that our team has some mad robot driving skills, the kids made lots of new friends and best of all, took home the coveted FIRST Robotics Motivate Award for their inspiring robotics journey. 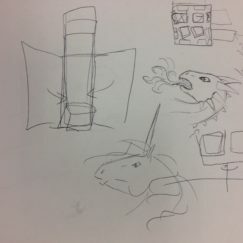 Not to mention, everybody at the event got to share in that one-of-a-kind, weird, wild, Spark-O-Matic magic. So, as far as we’re concerned, go robots‚Äîfull STEAM ahead!